Articles of Incorporation are filed with state governments to create a corporation. Each state has its own statute setting out what must be addressed and included. Some states require a great deal of detail, while others provide very simple forms with little required information. Regardless of the individual state requirements, articles of incorporation establish a corporation's legal existence. Articles must be filed with the Secretary of State, or state equivalent, for the corporation to be officially created and commence operations. Most states require the name and contact information for an incorporator, the person responsible for filling out and filing the articles of incorporation. 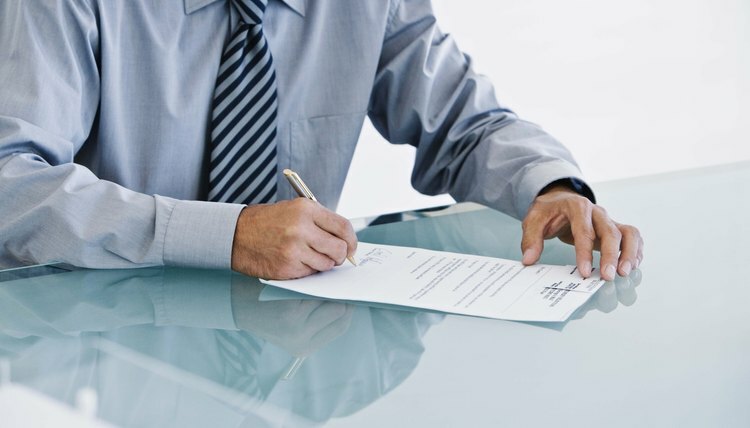 The incorporator is responsible for placing his personal signature on the articles and dating the signature. This is the individual the state contacts if there are any errors in the articles that require correction. The corporate name is another standard requirement for articles of incorporation. The name must be unique, and many states provide online search databases to make sure there are no other corporations operating in the state already using the name you've chosen. The name must also have a suffix that indicates its corporate status, such as Corp. or Inc.
A street address for the principal place of business is often required in the articles of incorporation, along with a designated registered agent for receipt of service of process. When a registered agent is required, the articles must also provide the street address where the registered agent is physically located. If anyone needs to sue the corporation, this is who they serve and where they serve process. If a corporation is issuing shares of stock, the articles of incorporation typically set out the number and type of shares the corporation is initially authorizing, how many of those shares are to be retained by the company, and how many are to be issued. States can also require the name and addresses of each initial member of the board of directors, as these are the individuals who are ultimately responsible for the corporation's operations. Articles of incorporation can present additional information, such as the corporate purpose, whether it is for profit or not for profit, its intended duration and what circumstances constitute dissolution of the corporation. There is usually a limitation of liability clause included in online forms provided by state departments for the corporate officers and members of the board of directors. Generally, the incorporator can include any information he or she deems necessary in the articles as long as it does not conflict with the laws of the state of incorporation. You incorporate a business in California by filing articles of incorporation with the secretary of state. You can incorporate by yourself or with others. California law has basic requirements that apply to all corporations, such as adopting bylaws and appointing officers and directors. After incorporating, additional state filings are required to keep your corporation in good standing. Michigan has a specific set of statutes governing the incorporation of ecclesiastical organizations. Ecclesiastical corporations must have at least three people to qualify under Michigan law. The organization's purpose must be to spread and teach religious principles. Michigan ecclesiastical corporations are nonprofit in nature. They generally also receive special tax exemptions from state and federal taxing authorities.